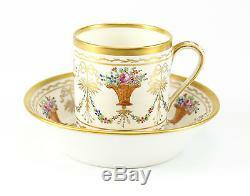 Description: 18th Century French Porcelain Hand Painted Floral Basket Cup & Saucer: Gilt & Multicolored Flowers. Cup 2.375 Diameter, 2.5 Height; Saucer 4.875 Diameter, 1.25 Height. No chips, cracks, or restorations. Very light wear to gilt. 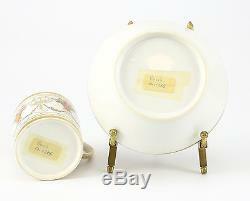 Light scuffs on the reverse of both cup, and saucer. (This item is located in Gardena). Domestic & International Customers - WELCOME! We guarantee the authenticity of all items to be as represented. We are prompt and professional with our correspondence and appreciate you taking the time to shop with us. "You are only as good as your last feedback". 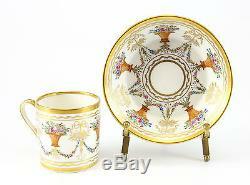 The item "French Porcelain Hand Painted Floral Basket Cup & Saucer Gilt. 18th Century" is in sale since Wednesday, November 19, 2014. This item is in the category "Pottery & Glass\Pottery & China\Art Pottery\European Pottery\French". The seller is "gallery_xv" and is located in Gardena, California. This item can be shipped worldwide.